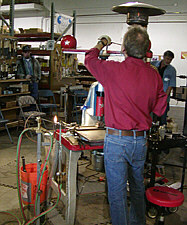 Texas blacksmith John Crouchet put on an excellent one-day demonstration on the selection and use of the fly press. 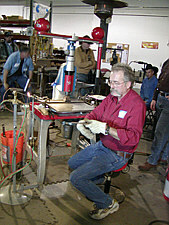 The event was sponsored by Pieh Tool Company and held in Camp Verde on January 14, 2006. About 40 people attended. In addition to the main topic, John also offered some interesting tips on pricing and selling your work, dealing with designers and architects, and on finishes. For those of you who missed this event, here is a brief summary. The fly press is not a magic pill or do everything machine. John uses it for two reasons: To improve productivity and to add value to his work. Productivity gains are due to the fact that many operations can be done cold. Veining, slitting straightening and edge treatments is some of the examples. Value added comes from the ability to quickly add details such as shadow lines, edge treatments and terminations that set your work apart and making it worth more money. John showed us the tooling he has developed and demonstrated how to use it. He provided numerous tips about making fly press tools. It is most important that the tool not bottom out in the ram of the machine. His tool shanks are made of 1 inch 1018 cold rolled steel. The length is fixed by tig welding a shaft collar to the shank. The business end is usually made of junkyard steel such as coil springs. Many of his tools are made for a specific job and then discarded. For more durable tools he recommends the use of S-7 tool steel. It has excellent red hardness and is easier for the blacksmith to heat treat than H-13. 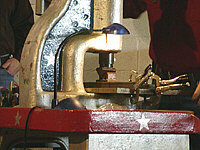 The demonstration consisted of both hot and cold work on the fly press. Heating was done using a propane forge and an oxy-propane hand torch he calls the “Dragon”. It is a gas saver with a foot-operated treadle. This allows him to apply spot heat while seated at the fly press. In his own shop he also has a propane forge on wheels that he moves near to the fly press. Some of the operations he demonstrated were circle bending, a pineapple twist, and tenons. He moved smoothly from the anvil to the fly press as dictated by the task at hand. In addition to the actual demonstration a considerable amount of time was devoted to discussion of design, business issues, and finishes. There were valuable tips that could be used whether one has a fly press or not. John’s stories and examples were very entertaining. A large part of his work consists of stair railings for custom homes. Most of the work is done in the shop. However, on each job he sets up a coal forge and anvil and forges some part on site. He says this invariably draws a crowd of neighbors and leads to further sales. He described his process for obtaining a rust finish. In his area the designers use a color palette and want rust colors that match it. He has a technique for making “all 18 colors” of rust. He has even named some of them such as Hollywood Rust. The designers love it. He has found that the top end custom homes in his area are all designed by a few architects, decorated by a few designers and built by a small number of builders. By catering to this select group he has all of the work he will ever need. He said that the hardest lesson for him was learning how to ask enough for his work. John gave some excellent advice on buying a used fly press. The most important tip was never buying one without personally inspecting it. Cracked frames simply cannot be repaired successfully. Missing or damaged parts are nearly impossible to obtain. John’s background is in the jewelry industry. There he bought used fly presses and set up production operations for manufacturers. He gave us a brief history of the machine and told why so many of the American fly presses were made in Providence Rhode Island. He explained the numbering system (it has nothing to do with capacity) and told us where and how to find literally hundreds of used machines. His best advice on purchasing was to buy one of the new fly presses being imported from India. He was initially skeptical about their quality and durability. However after using them he is convinced that this is the easiest and most reliable way to obtain a good machine. This demonstration was a day well spent even if you have no interest in ever obtaining or using a fly press. The business and design information was very valuable. John’s DVD/VHS by Teaching Tapes on the fly press are available through Pieh Tool Co., Inc. (928-554-0700). While he says that the video is “strictly Hollywood”, I found it to be very informative and well produced. At the end of the day I saw several new fly presses being loaded on trucks and leaving Pieh Tool Company. It was a good day for all.